Times: The Village is open 9:30 am to 4:00 pm. Hands-on workshop times vary; pre-registration is required. Join us for our April 25 Home School Day! This month’s Home School Day will focus on arts and leisure activities. Children in the early 1800s had to help with many chores around the house, but there was also time for fun and artistic pursuits. Participants in these workshops will flex their artistic skills by making 1830s-inspired art projects and creating fun games to bring home. 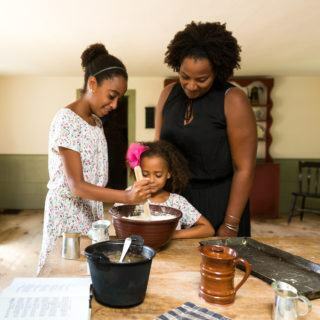 Try out one of our Make History Guides as you explore on your own or sign up for a special hands-on workshop at the Museum Education Center (see below). Hands-on crafts are available for children under 5 on a drop-in basis throughout the day at Museum Education. We recommend that you allow three hours to visit the Village in addition to scheduled hands-on workshops. Online registration opens one month prior to each event, and pre-registration is required. Home School Days are rain or shine programs. 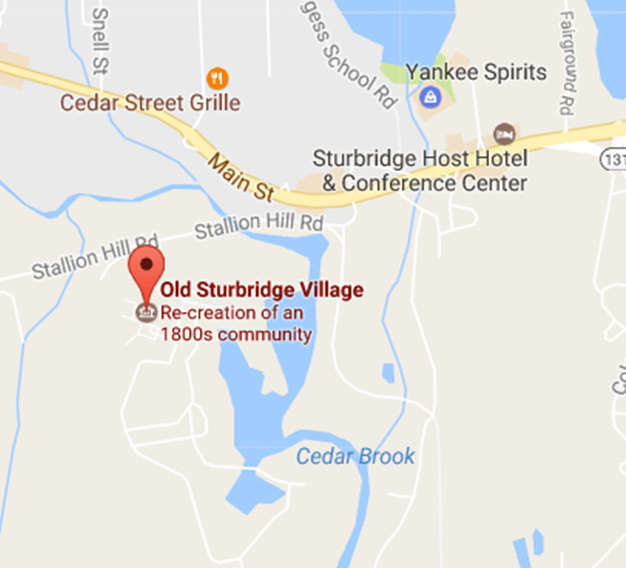 Registration fees are non-refundable unless the program is canceled by Old Sturbridge Village. Homeschool parents receive the discounted $15 admission rate at a ratio of one adult to one child between the ages of 5 and 17. Make your own wooden knitting needles and then learn how to start knitting using yarn made from wool. We will talk about the dyes people used in the 1830s to give color to their textiles. Later, visit the Village sheep on your own! Let’s learn about what people wore in the 1830s! Students will explore clothing of the time period and design an 1830s-inspired outfit for their own paper doll. After that, we will learn about the principles of weaving as well as the process of turning sheep’s wool into beautiful cloth. Reverse glass painting was a very popular form of decoration in the early 1800s. We will utilize our painting skills to create a design directly on glass. Theorem painting was a popular form of decorative stenciling in the 19th century, done on fabric or paper. We’ll use intricate stencils and paint to create a beautiful cloth to use as a napkin, cover cloth, or just a decoration! Learn the rules of the classic game 9-Men’s Morris and practice your skills. Then, make and decorate a wooden board to bring home with you! Sand and paint a set of toy houses. While we decorate, we will explore the different types of toys and games that kids played in the 1830s. Use your carpentry skills to create a simple but buoyant sailboat made from wood. Our boats will be equipped with a sail that we will decorate to remember our time at OSV! Participants in this workshop will make a portfolio to hold all of their music, poetry, and drawings. We will also marble paper to decorate the inside of the portfolio. It’s spring, which means that the garden beds need tending. Participants will pick rocks from the garden beds, rake the soil smooth, and plot out where to plant our beans and peas. We will also plant our own seeds to take home. Practice some basic woodworking skills while making a simple and useful toolbox! Try out several implements on your own and learn about tool safety. Please note: This workshop will meet at Museum Education. We will then walk into the Village for the program. Flex your artistic skills in the Village’s gardens with a talented artist and costumed historian. We will explore what’s starting to grow in the gardens and then create a beautiful and detailed botanical watercolor. Sign Up for Our Home School eNews List! Never miss out on another Home School Day Announcement! You can also sign up to receive news about other programs at the Village.